The digital world has transformed how people communicate, do business and share their world with friends and colleagues. 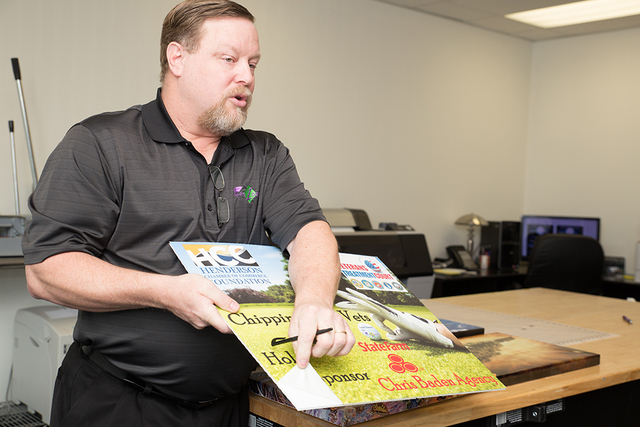 A national company, which relocated to Henderson in 2015, is blending the advancements of technology with the old-school print. The digital world has transformed how people communicate, do business and share their world with friends and colleagues. A national company, which relocated to Henderson in 2015, is blending the advancements of technology with old-school print. 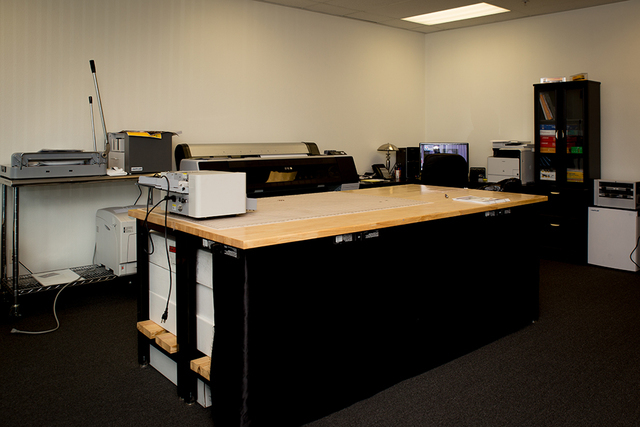 FotoZoomer, through its corporate and franchised locations, supplies kiosks where the public can bring their files or items to scan and turn them into anything from small, portable photos to massive 44-inch-by-10-foot- posters, signs or banners, all while waiting onsite. FotoZoomer moved from South Carolina to a 4,000-square-foot space on Eastgate Road, near U.S. Highway 95 and Lake Mead Parkway. At the start of 2017, the company expanded. “We almost tripled the size of the offices we were in, and we’re about the same size warehouse when it comes to total number of square feet,” said Eric Steadham, FotoZoomer president. The move has made it easier on FotoZoomer’s West Coast clients, especially in the reduction of shipping times. The company has been in operation for about 12 years and has operations in all but two states — South Dakota and Alaska — although Steadham said he’s working on the latter. Expansion is expected in the next 12 to 24 months: Steadham said he’s looking to add about 15 to 30 employees in that time and additional offices and space as needed. Currently, there are two franchisees in the Las Vegas area, both in the pack-mail industry. One of them is PostMaxx in Henderson. Franchisees work with FotoZoomer on buying supplies they need for printing, though Steadham said the company doesn’t compete with its local franchisee stores. The corporate store lowers its production as the market fills up with franchises, he said. Brad Wise, co-owner of PostMaxx, said he took on the machine as a business decision, but more importantly, to satisfy a goal of getting more involved in the community. Wise estimated the cost of his new FotoZoomer kiosk at around $19,000, and he said it was going to be delivered around the end of January. Steadham said the company trains franchisees, which do the actual printing, to use the equipment and how to raise money for nonprofits, schools and youth organizations. Franchisees give 10 percent back to these types of groups through FotoZoomer’s No Brainer Fundraiser program. The FotoZoomer equipment has its advantages for organizations such as schools. FotoZoomer can be found inside many pack mail operations, though Steadham is trying to shift that to hotel-casinos on the Strip, where he sees potential in the wedding business in the resort corridor. For weddings, FotoZoomer offers some specialty items. “We can print on a metallic paper, and we can stretch it like a canvas as well,” he said. In the wedding market, FotoZoomer and its franchisees sometimes have to deal with professional photographers. Photographers can gain more control over their work by using FotoZoomer’s systems, Steadham said. Also, on Steadham’s mind is the arrival of the Golden Knights, Las Vegas’ new NHL team set to start playing in the 2017-18 season. Steadham said he’s in conversations with the team to offer FotoZoomer services during the game, adding something interesting to the mix for fans. The next big market for FotoZoomer will be document printing.